Given by James W. Fleming. 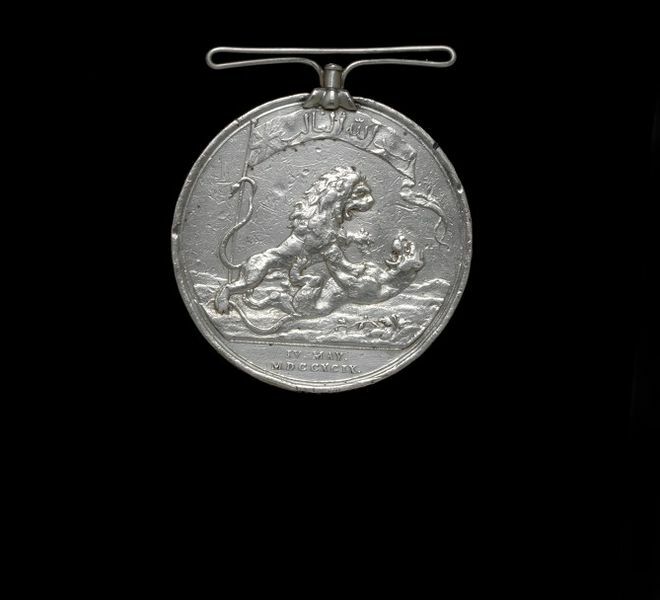 The obverse of this silver medal represents the British lion overcoming the Bengal tiger, and the date IV. May MDCCXCIX. It depicts the British lion overcoming a tiger representing the Mysore ruler. The Arabic inscription on the banner was on the weapons of many Muslim warriors, including Tipu Sultan. It reads: Assadullah al Ghaleb, ‘The conquering lion of God’. The reverse shows the siege of Seringapatam. Each of the thousands of soldiers of the British army who participated in the siege of Seringapatam later received a medal. These were made of gold, silver, bronze or tin, depending on the recipient’s rank. They were designed by Conrad Heinrich Küchler in about 1801, and struck at the Soho Mint in Birmingham. The reverse of the Seringapatam medals depicts Tipu Sultan’s capital from the opposite bank of the river Kaveri, the view seen by the British forces as they massed for their final assault. The Persian inscription reads Seringapatam 28 Zul qa’da 1213 hijri khodadad, meaning ‘Seringapatam, 4 May 1799, given by God’. Each of the thousands of soldiers of the British army who participated in the siege of Seringapatam later received a medal. These were made of gold, silver, bronze or tin, depending on the recipient’s rank. 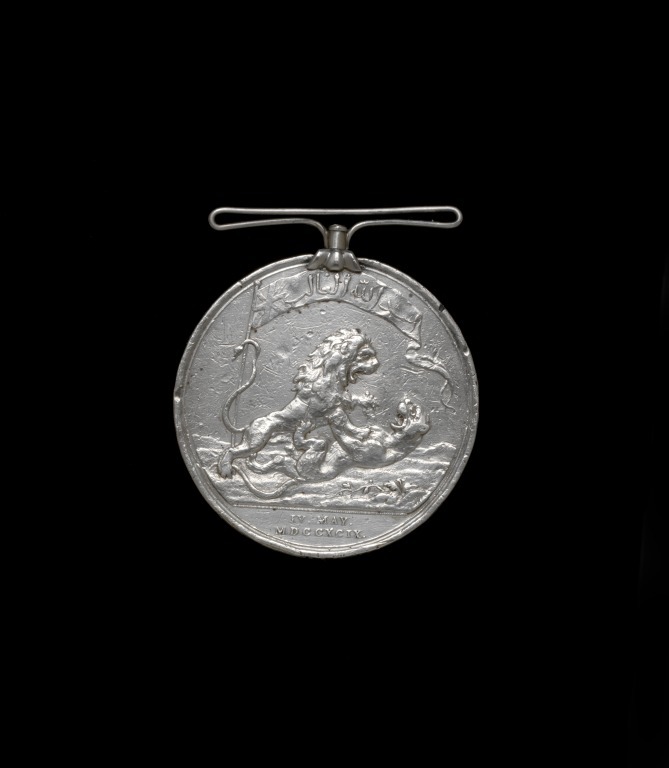 The medal’s obverse depicts the British lion overcoming a tiger representing the Mysore ruler. The Arabic inscription on the banner was on the weapons of many Muslim warriors, including Tipu Sultan. It reads: Assadullah al Ghaleb, ‘The conquering lion of God’. Obv., the British lion overcoming the Bengal tiger, and the date IV. May MDCCXCIX. Rev., the siege of Seringapatam. Swivel and ribbon. This is one of a set of 850 silver medals from over 50,000 campaign medals presented to all ranks who had fought at Seringapatam in 1798-99. 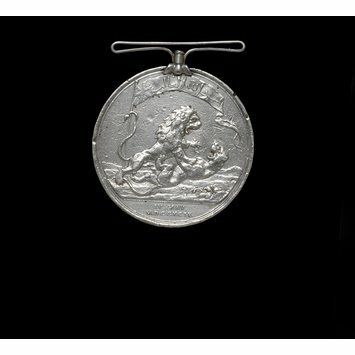 Silver medal, the British lion/the siege of Seringapatam. English 19th century. List of Objects in the Art Division, South Kensington, Acquired During the Year 1877, Arranged According to the Dates of Acquisition. London : Printed by George E. Eyre and William Spottiswoode for H.M.S.O. p. 123. This medal commemorates the British victory over Tipu Sultan, ruler of Mysore, at the siege of Seringapatam (4 May 1799). More than 50,000 soldiers took part in the campaign and each received a medal. This is one of 850 made in silver. The obverse shows Tipu Sultan’s emblem, the Bengal tiger, being overcome by the British lion.